German Shepherd Dogs for sale. Ethical breeder of OFA health certified breeding dogs. Tempermanet Certified and working-performance bloodlines. Purchased a male GSD from Excelon about 9 years ago. 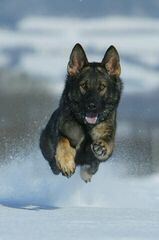 He was a male GSD from working German lines, GREAT DOG (from the “B’ Litter). Worked him in some Schd, tracking and obedience. At ten years of, he is still out doing his thing and enjoying life. Very healthy dog, no hip/elbow problem. Does have lower back degeneration, but that is expected for the age of the dog, and the dog doing bit work and hard training. I would recommend Excelon, who was recommended to me by a long time friend who was in the dog training breeding business.